Sinethemba Jantjie (15 February 1989 – 1 April 2019) was a South African professional footballer who played for Mbombela United and Free State Stars as a winger. Mbombela United FC is a community soccer team based in the Mpumalanga provincial of Mbombela, formerly known as Nelspruit. It plays in the National first Division of South Africa. The team was established in 2010 and is wholly owned by the Matsebula brothers, Skhumbuzo and Oupa who are prominent business people in the transport and property sector. It is popularly known as Tingwenyama which means pride of lions in the local SiSwati language. Since its formation, the team has been given first priority for talent showcase to young boys from around the Mpumalanga province more especially from the Lowveld. During the 2012/13 season, The Mbombela United FC won the Mpumalanga provincial SAFA League then known as Vodacom league under the guidance of caretaker coach, Lesego Matsomela and represented the province but failed to qualify for an NFD spot. Bethlehem is a large town in the eastern Free State province of South Africa that is situated on the Liebenbergs river along a fertile valley just north of the Rooiberg Mountains on the N5 road.It is the fastest growing town in the Free state province, with its target of being the Fourth largest city after Kroonstad in balance. The South African Premier Division is the highest division of South African football league system. As the division is the top level of association football in South Africa, it is often referred to as the PSL – the name of the league's administrator. Daine Klate is a South African football (soccer) midfielder for Bidvest Wits and South Africa. Elias Gaspar Pelembe, also known simply as Domingues, is a Mozambican footballer who currently plays for Bidvest Wits in the South African Premier Soccer League and Mozambique. His position is midfielder. Nedbank Cup is a South African club football (soccer) tournament. The knockout tournament, based on the English FA Cup format, was one of a weak opponent facing a stronger one. The competition was sponsored by ABSA until 2007, after which Nedbank took over sponsorship. The 2009–10 Premier Soccer League season was the fourteenth since its establishment. Supersport United were the defending champions, having won their second premier league title in the 2008–09 season. The campaign began in August 2009, and ended in March 2010. A total of 16 teams competed in the league. SuperSport United were crowned champions for the third successive time two matches before the end despite losing to Bidvest Wits (1–2) in the last match. Robin Ngalande Junior is a Malawian international footballer who plays for Zira, as a striker. 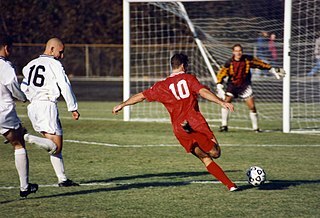 The 2012–13 Premier Soccer League season was the seventeenth season of the Premier Soccer League since its establishment in 1996. The season began in the second week of August 2012. Edwin Gyimah is a Ghanaian professional footballer who plays as a defender and midfielder for the Ghana national football team and Bidvest Wits. The 2013–14 South African Premier Division season was the eighteenth season of the Premier Soccer League since its establishment in 1996. The draw for the Premier Division fixtures for the 2013/2014 season was held on 20 June 2013. The season was scheduled to begin on 2 August 2013 and end on 10 May 2014. The 2013 MTN 8 was the 39th tournament of South Africa's annual football (soccer) cup competition. It featured the top eight teams of the Premier Soccer League table at the end of the 2012-13 season. Thabani Mthembu is a South African professional footballer who plays for Supersport United as a striker. The 2014–15 South African Premier Division season was the nineteenth season of the Premier Soccer League since its establishment in 1996. Fixtures were announced 5 June 2014. The league opened on 8 August 2014 and will conclude on 9 May 2015. The 2015–16 South African Premier Division season is the twentieth season of the Premier Soccer League since its establishment in 1996. The 2016–17 South African Premier Division season is the 21st season of the Premier Soccer League since its establishment in 1996. The 2016–17 Nedbank Cup is a South African club football (soccer) tournament. The knockout tournament, based on the English FA Cup format, was one of a weak opponent facing a stronger one. The 2017-18 South African Premier Division season is the 22nd season of the Premier Soccer League since its conception in 1996. The 2018–19 South African Premier Division season is the 23rd season of the Premier Soccer League since its establishment in 1996. The season will begin in August 2018 and will conclude in May 2019. Mamelodi Sundowns are the defending champions. 1 2 3 4 5 Nick Said and Tiyani Wa Ka Mabasa (1 April 2019). "PSL star Sinethemba Jantjie killed in car accident, Free State Stars confirm". Times Live. Retrieved 10 April 2019. 1 2 Sinethemba Jantjie at Soccerway. Retrieved 10 April 2019. 1 2 Khaya Ndubane (12 April 2019). "Wits declare Jantjie's contract 'null and void'". Citizen. Retrieved 12 April 2019. ↑ Tiyani Wa Ka Mabasa (11 April 2019). "Free State Stars out to turn tragedy into triumph". Sowetan Live. Retrieved 12 April 2019. ↑ Pedro Mapelo (7 April 2019). "Free State Stars captain vows to dedicate all remaining games to Sinethemba Jantjie". IOL. Retrieved 12 April 2019. ↑ Mark Gleeson (3 April 2019). "Free State Stars game postponed for Sinethemba Jantjie funeral". Times Live. Retrieved 12 April 2019. ↑ "PSL to observe moment of silence for Sinethemba Jantjie". Sports24. 1 April 2019. Retrieved 12 April 2019.